The Our Lady of the Hungarians Cave Church (in Hungarian "Magyarok Nagyasszonya sziklatemplom", also known as St. Gellért Cave Church or Gellért Hill Cave Chapel and Church) was built by Károly Weichinger in 1931, architect: dr. Kálmán Lux. In addition in 1934 a neo-romanesque style Pauline Monastery was built next to it. 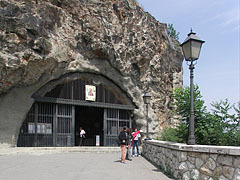 The Lourdes pilgrimage site of France inspired the builders, the idea was to create a shrine here by extending artificially the former natural Saint Ivan's Cave. 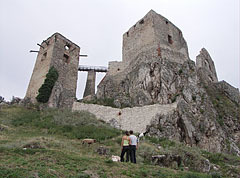 Bakony is situated northward from Lake Balaton; it is characteristic of the region. The lovers of romantic places will surely be fond of its endless oak forests, lovely and gently sloping land, streams, castles and church ruins in the depths of the woods. These dark forests used to hide the famous outlaws of Bakony in the 19th century. They used to conceal themselves and their prey in caves in the woods. 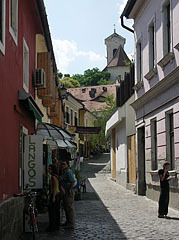 It may seem that the small cobbled and narrow streets of Szentendre have Mediterranean atmosphere. Those who feel like this are right, because beside the Hungarians there were people of several nations from the Balkans and its surroundings who settled down in this town, already centuries ago. They brought their culture and of course their architectural styles here which contributed to the diversity of Szentendre. Among other things this is why the town is often called a "jewelry box".